TiVo recently released a white paper based on findings from the Q3 2018 consumer survey conducted by Ampere Analysis. Comprising 26,000 individual respondents and covering 12 mature global markets, the survey analyzed pay-TV, SVOD and voice control device usage. 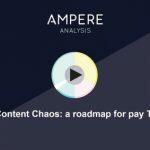 “Navigating Content Chaos: A Roadmap for Pay-TV Operators” presents survey results and makes the case for better serving consumers with next-gen user experiences to compete in the OTT world. For maximum impact and retention of high-value consumers, operators will need to provide these viewers with the best possible integrated, user-centric navigation tools. For further exploration of these findings and a complete analysis of all survey results, download the white paper.